This circuit is built around the toneful BC108 silicon transistor. It is authentic in every detail, featuring a hand-wired circuit board and circuitry carefully matched to original specs. Vintage Crest Audio Dallas Arbiter England Silicon Fuzz Face 1980s RARE! This pedal was made in England-UK in the late 1960's or early 1970's. The pedal has the BC-183 Silicon transistor. With both knobs all the way up the pedal is still only about 1/2 as loud as it should be. For sale is a 1972 Dallas Arbiter Fuzz Face effects pedal. This is the real deal! This Fuzz Face gives your tone plenty of depth and dirt. This is one of the higher gain Fuzz Faces I have played. This pedal works perfectly and sounds great. For sale is a 1970's Dallas Arbiter Fuzz Face effects pedal. This is the real deal! This Fuzz Face gives your tone plenty of depth and dirt. The switch, the back plate, and knobs are not original to the pedal. 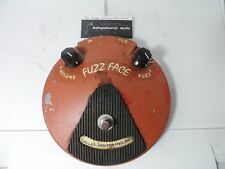 FUZZ FACE BY DALLAS-ARBITER-ENGLAND / DUNLOP. FUZZ / DISTORTION PEDAL. MODEL JHF-2. Silicon transistor specification with two BC109C, stable operation compared to germanium transistor, distortion amount increased and intense sound is characterized. It is Dallas-Arbiter FUZZ FACE by Crest Audio Inc. which was sold in the 1980's. Offered is a mint condition, limited run Lovepedal Billet Bullnose fuzz pedal which is their tribute to the legendary Dallas Arbiter Fuzz Face made famous by so many artists including Hendrix. The tone of this pedal is simply sensational and very sensitive to touch and the volume controls on the guitar. You’ll be ripping iconic riffs in no time. Case is solid billet aluminum, CNC machined for a unique modern appearance and part of the special run of Billet series which are not available for regular purchase. Don’t miss your chance to pick up this beauty — free shipping to the USA, Canada, UK, Europe, ANZ and Japan. Other locations please contact me. Thanks!